I've been dreading writing this blog post. 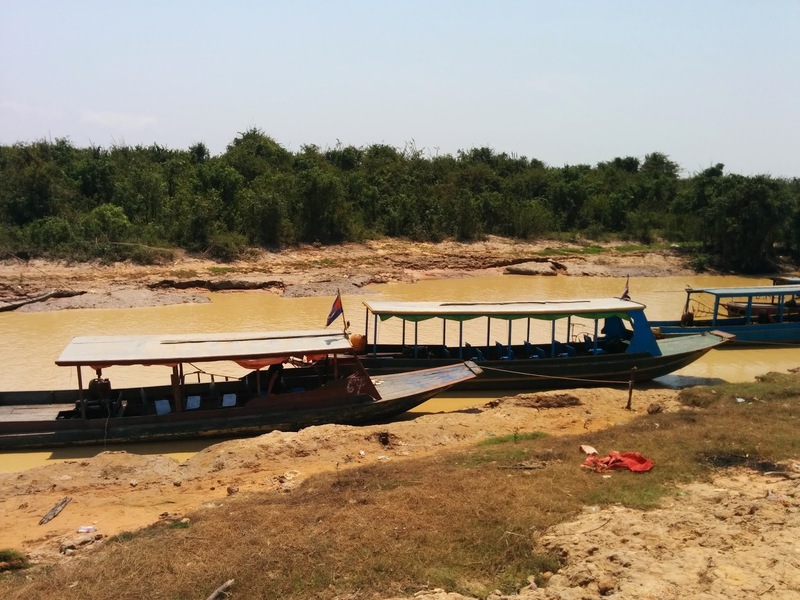 Just remembering the 2-3 hours we spent at Kompong Pluk is somehow tiring - though we did very little there other than sit on various types of transport. 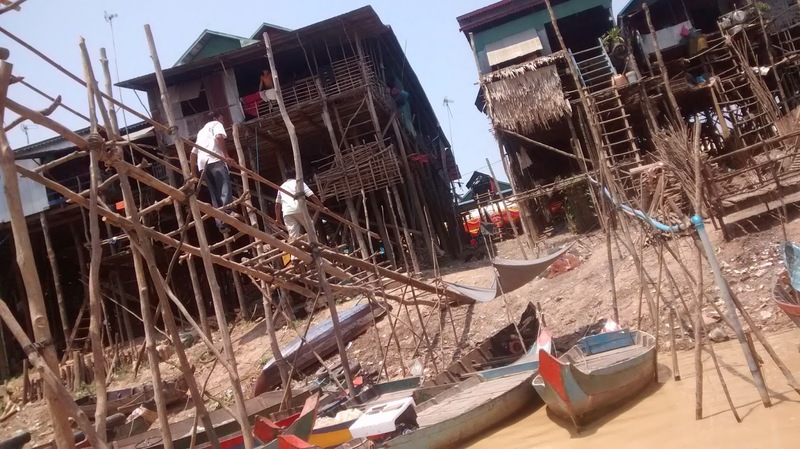 The only good part about writing about the experience is that I can split this long account into two posts for the AtoZChallenge - K for Kompong Pluk and L for Lake Tonle Sap. But as usual, I'm beginning somewhere near the end. Let me begin on the morning of Day 3. We had just finished visiting the Ruolos group of temples, which is about 10-15 kilometers to the east of Siem Reap town. The next item on the itinerary our hotel had provided was the Floating Village, which sounded very exciting. Which of the Floating Villages would we like to visit, our tuk-tuk driver asked us - the smaller one or the larger one? Since we had no way of knowing which one was better, we replied - whichever is closer. And so we started off. 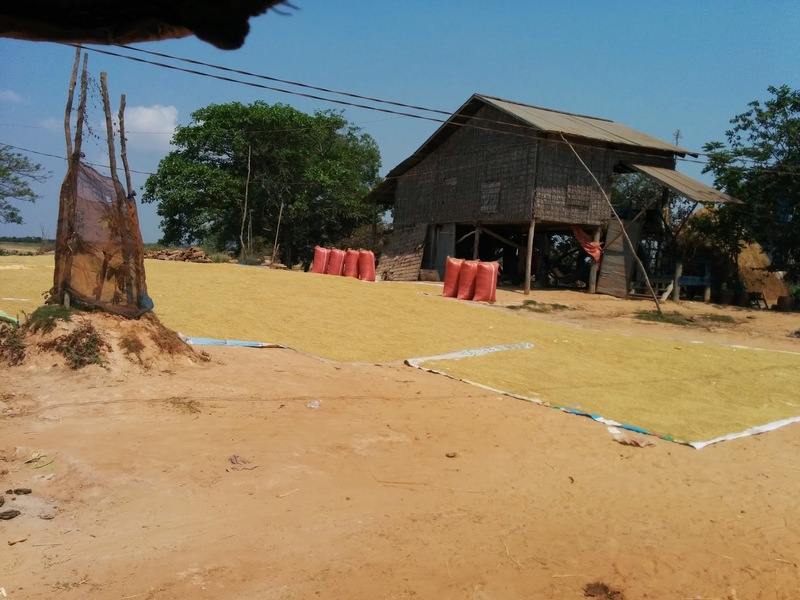 We drove for what seemed like hours (but was probably no more than half an hour) through rural Cambodia. The roads were untarred, but serviceable. We kept ourselves entertained by comparing rural Cambodia to rural Kerala, and by commenting on how similar the two were. 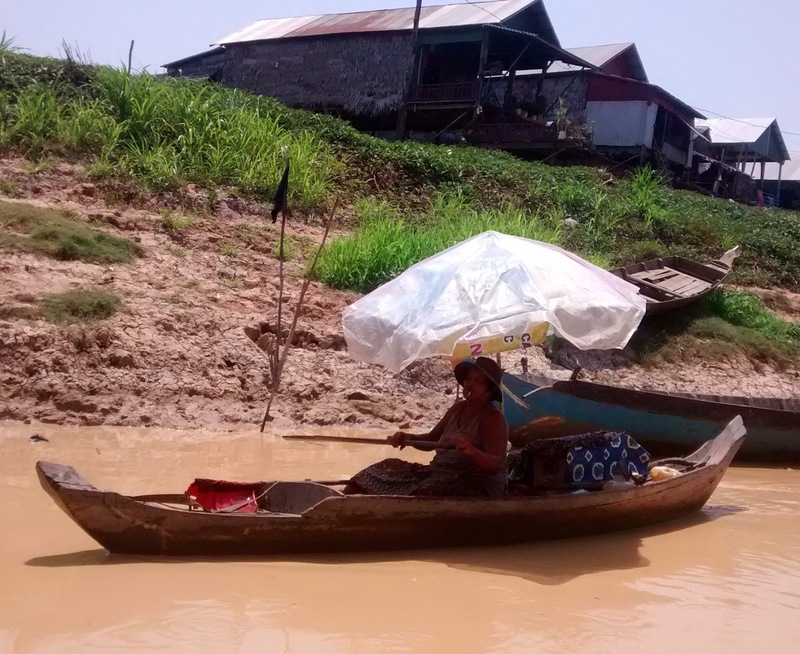 Perhaps Cambodia is a bit drier and dustier, but that may just have been the season. Oh, and the houses are on stilts! After some time, we started seeing more greenery around us, and guessed that we were close. Soon enough, the trees on either side disappeared; the landscape opened out. 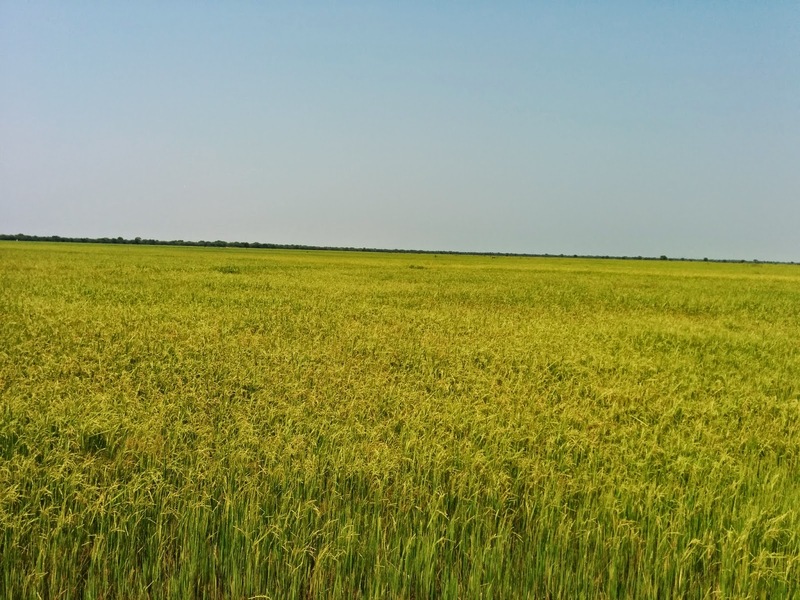 Wet green paddy fields surrounded us, shimmering in the heat and the sunshine. What is this green called? We soon arrived at a sort of check-post, with a one-storey building to one side. Our driver told us that we had to buy tickets in order to proceed further. And so we got off, glad to stretch our legs. Seeing us, one member of a group of men who had been lounging nearby scrambled behind the ticket counter. This made us faintly suspicious - were we being had? Here we were, in the middle of nowhere, being asked to buy tickets from a guy who had just got behind a counter at a small building in the middle of acres of paddy fields. Still, we trusted our driver, and paid for the tickets. 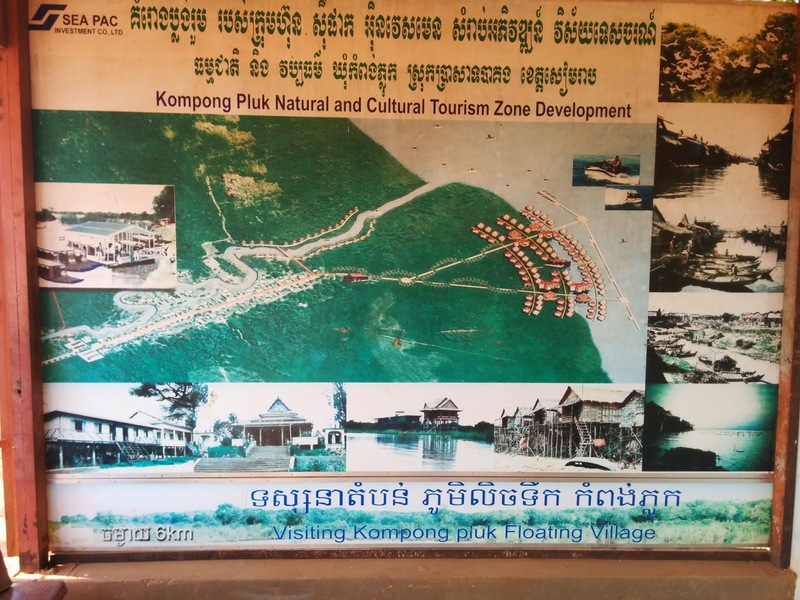 We were also reassured by an official-looking board outside the building, which told us that we were entering ‘Kompong Puk Natural and Cultural Tourism Zone Development”. The guy behind the counter told us that the tickets were actually $20 per person, but $28 for a couple. Thank God for small mercies. $20 is how much an entire day's pass at the Angkor Archaeological Park costs, by the way. The road led straight on through more paddy fields. A narrow muddy channel of water kept us company on the left. Despite the wet paddy fields and the canal, the road was dry and dusty. On the way, we saw a brace of ducks, some skinny cows, a few farmers going about their daily routines. Being from India, we had never seen these things before in our lives, of course. We finally reached another entry gate, with a one-roomed cabin next to it. Ahead, we could see a long line of old decaying boats tied to the muddy bank. The cabin had about half a dozen men, and one of them (a kid, really) leapt nimbly onto our tuk-tuk. He was to be our guide, we guessed. He guided us to one of the boats, even more dilapidated than the rest, and helped us in. It took him a couple of tries to start the boat. But the engine finally fired, and we were off! The noise of the engine was terrific and terrible. Our boat created gigantic brown ripples in the narrow canal. On our left was what looked like a mangrove, and on our right the tall muddy bank. We wondered what would happen if another boat came along. Would the two boats pass each other unharmed? Our question was answered within a few minutes. We saw a boat with half a dozen fellow tourists heading towards us. Our boat boy went far to the right to avoid it. In fact, he turned the boat so sharply that we got stuck on the muddy bank. The tourists passed by, all waving merrily, but we were still stuck in the mud. It took the boy five minutes to get us loose. My husband and I sat still in the boat – partly amused and partly alarmed. Were we really trusting our lives to a boat that was barely able to float? Our only consolation was that the canal didn't seem very deep. On we went. A few hundred meters further on, the first of the ‘floating houses’ started appearing - tall blue thatch structures that managed to be cheerful and depressing at the same time. Every house was on stilts, with narrow ladders for the residents to climb up. During the rainy season, the entire place will be covered in water, and the houses will seem, indeed, to be floating. The Floating Village is a village of fishermen and fisherwomen. Outside each house were half a dozen boats - both big boats like the ones we were on, and narrow canoes. We saw kids catching fish with nets, clad in barely anything. People sat on their front porch up above and stared at us. It soon became clear that the place is more of a slum than a village. We started feeling uncomfortable - who were we to spy into their lives like this, to stare at them going about their lives, to take photos of their houses and their boats and their laundry? We weren't rich aliens from another planet, we didn't belong to a different species. Hell, we came from a third world country too - with slums just as bad or far worse than this one. How they must resent us and our cameras, we thought. We fervently hoped that some of the money that we had paid would trickle down to them. Just as these uncomfortable thoughts were starting to bubble up in our mind, we left the village behind. The next part of the journey is in the next post. Till then, let me leave you with this comparatively cheerful photo of a fisher-woman happily having a cigarette while going about her daily routine. Very good, informative narrative with deep analysis. Had you mentioned the cost per service, it could have been more helpful. Mentioning good service providers and eateries would also be useful Keep writing. Your style is good.